When I think of the holiday season, the first thing that comes to mind is all the deep and inviting fragrances that this time of year brings. As we awaken from our Thanksgiving feast-induced stupors, we undoubtedly will be bombarded with the smells of the holiday season for the next 30 days – smells that will trigger memories of holidays past, like warm cookies fresh out of the oven, the rich spices in mulled wine and ciders, and the best smell of all to an outdoor enthusiast like me, the crisp and clean scent of Christmas trees. The Smell Of Christmas Is In the Air… and bark! Christmas trees are an evergreen conifer, a type of tree that includes spruce, pine, and fir. Have you ever wondered what gives Christmas trees their signature scent? The answer is a mix of chemicals called terpenes. Terpenes are in the sticky resin substance exuded by these conifers. Terpenes are a class of molecules that give off the sharp and sweet Christmas tree scent. When the tree bark is damaged, such as when the tree is cut down to be sold, the resin flows out of the bark. In nature, the layer of resin hardens to protect the damaged area of the bark. The terpenes in the resin inhibit the growth of fungi and also deter herbivores, notably the bark beetle, which otherwise would feed on the tree. Terpenes are also released into the air. If you’ve ever been to or seen pictures of pine forests and mountains, you might have noticed a hazy, blue aura and clouds above the trees. Scientists believe that the terpenes released by the trees into the atmosphere react with the air to collect moisture and form clouds in order to protect the trees from harsh sunlight and to keep the forest cool. Terpenes are what make the Smoky Mountains smoky! The principal molecule that gives the earthy pine smell to the trees is called pinene. Pinene has two different forms called alpha-pinene and beta-pinene. These two molecules are mirror images of each other,* and beta-pinene is what provides the woody fragrance we associate with pine trees. Both forms of pinene are very flammable and are the reason Christmas trees and pine cones burn easily. This is also why forest fires can spread so quickly. At room temperature, pinene molecules are volatile and evaporate, fortunately, is which is why we are able to smell them so strongly in our homes! Different species of conifers have distinct smells due to different mixtures of various molecules. For example, bornyl acetate, also called heart of pine, gives off the rich depth of pine scent and is found in pine and fir trees. ** This is the compound that is commonly used to make pine fragrances you see sold in stores. Both balsam firs and silver pines (two species of conifers used for Christmas trees) are rich in bornyl acetate. Other molecule compounds that give off distinctive scents include limonene (a citrus scent), camphene (a camphor aroma), and alpha-phelladrene (a minty and citrus-y fragrance). So now we know that terpenes are made by conifers to protect themselves from other organisms, and they happen to confer that refreshing scent that many of us bring into our homes in December. But, did you know that many non-fragrant consumer products are made with terpenes as well? You may guess correctly that the most widely used product made from terpenes bears its name – turpentine. Turpentine is a solvent that is used as a paint thinner. Terpenes are also used in medicine as an anesthetic and even in anti-malarial and anti-cancer treatments. Additionally, plant-derived compounds have been the focus for a more sustainable future. Many scientists and engineers in the past couple of decades have concentrated their efforts to develop processes that might allow terpenes to replace petroleum in both the fuels and plastics industries. E. coli bacteria - the strain of bacteria genetically engineered to produce terpene. Chemically, terpenes and petroleum are related because both are mixtures of compounds called hydrocarbons, or molecules composed only of hydrogen and carbon. Although the chemical structures of the compounds are different, scientists are familiar with the processes and procedures needed to manipulate hydrocarbons into useful molecules. The benefit of using terpenes instead of petroleum is that they are a renewable resource, reducing our dependence on fossil fuels and thus our impact on the environment. Terpenes are generated in large amounts as a waste product by the lumbering industry, but unfortunately, conifers do not produce enough terpenes to sustain a fuel industry. Two tons of wood chips only provide 4 kilograms (8.8 lbs) of crude turpentine. To address this, scientists are exploring the potential of genetically engineering bacteria to produce these compounds. To this end, a research group at the University of California, Berkeley has created a strain of bacteria that can convert sugar into terpenes, showing that these genetically modified bacteria may be a sustainable source of terpenes in a process that is analogous to brewers using yeast to make beer. Research conducted in the Navy in the last decade found that two molecules of the pinene joined together has very similar properties to JP-10, a rocket fuel that is widely used in commercial and military launches. This researched has inspired biochemistry researchers to pursue pinene as a cheaper and sustainable fuel. In 2014, a laboratory at the Georgia Institute of Technology created a bacteria strain that produces pinene in the hopes of providing an alternative fuel source. Efforts now in this field are aimed at scaling up pinene production to be efficient and cheap enough to be viable in the fuel industry. 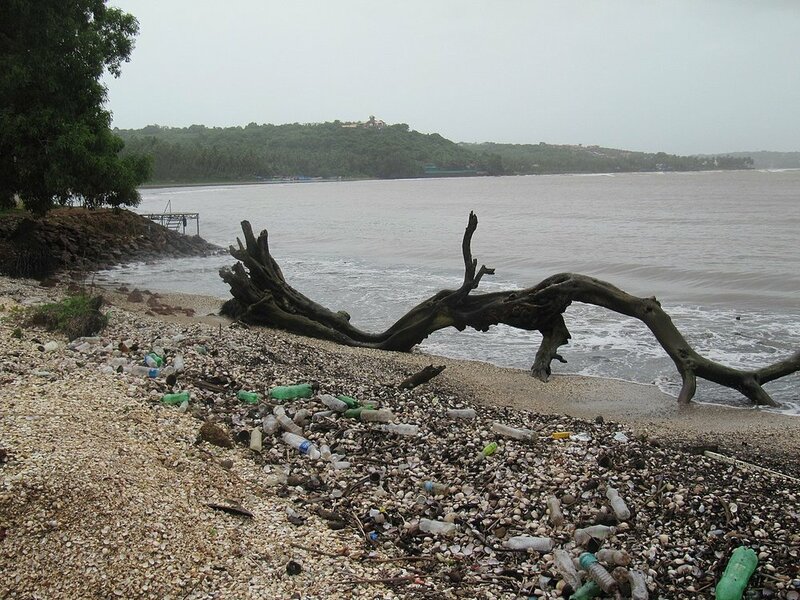 Plastic pollution often accumulates on beaches. Another environmental issue being addressed with terpenes is the plastics industry. The large amount of plastic being created and disposed of is filling our landfills and oceans, and entire islands composed entirely of this garbage have been found in the Pacific Ocean. It is amazing and sad to think that almost every piece of plastic that has ever been produced is still in existence because the vast majority of plastics are not biodegradable. Furthermore, the process of creating these plastics requires petroleum. Even biodegradable plastics made from corn or sugar cane require some form of crude oil to manufacture. A research group at the University of Bath is investigating the use of pinene as an alternative to oil to produce these biodegradable plastics, as these polyesters (the main component of plastics) combined with pinene can create a flexible and strong material, completely circumventing the use of fossil fuels. Given the staggering amounts of plastic being created every day, even eliminating just the need for fossil fuels would have a large impact. Christmas trees throughout history have come to be a symbol of life and hope, staying green through the entire winter and reminding people of the spring to come. Perhaps this year when you take a deep breath and savor that sharp and sweet pine scent, you will have a new appreciation for these trees. These trees are no longer only a symbol of hope, but the very chemical compounds that it produces could be the key to a sustainable and more environmentally conscious future for us all. *Molecules that are non-superimposable mirror images of each other are called enantiomers. **Bornyl acetate belongs to a class of compounds called esters. Esters are found in fruits and are known and used for their pleasant smells. · “The Aroma of Christmas Trees.” Compound Interest, 19 December 2014. http://www.compoundchem.com/2014/12/19/christmastrees/. 24 November 2017. · “Bacteria could be rich source for making terpenes.” News from Brown. Brown University, 22 December 2014. https://news.brown.edu/articles/2014/12/terpenes. 24 November 2017. · Conners, Deanna. “Why pine trees smell so good.” Earth. EarthSky, 22 December 2016. http://earthsky.org/earth/why-conifer-christmas-trees-pine-spruce-fir-smell-terpenes. 23 November 2017. · Helmenstine, Anne Marie. “Why Christmas Trees Smell So Good: Chemistry of the Christmas Tree Aroma.” Science, Tech, Math. ThoughtCo. https://www.thoughtco.com/why-christmas-trees-smell-so-good-606134. 24 November 2017. · Howgego, Josh. “Terpenes: not just for Christmas.” Education in Chemistry. Royal Society of Chemistry, 1 January 2014. https://eic.rsc.org/feature/terpenes-not-just-for-christmas/2000116.article. 23 November 2017. · Kirby, James, et al. “Enhancing Terpene Yield from Sugars via Novel Routes to 1-Deoxy-D-Xylulose 5-Phosphate.” Applied and Environmental Microbiology 81(1): 130-138 (2015). · Romuld, Maggie. “That Christmas Tree Smell Just Got a Lot More Interesting.” Nature. The Science Explorer, 5 January 2017. http://thescienceexplorer.com/nature/christmas-tree-smell-just-got-lot-more-interesting. 23 November 2017. · Quilter, Helena C., et al. “Polymerisation of a terpene-derived lactone: a bio-based alternative to ε-caprolactone.” Polymer Chemistry, 8: 883 (2017). · Sarria, Stephen, et al. “Microbial Synthesis of Pinene.” ACS Synthetic Biology, 3(7): 466-475 (2014). · Vance, Erik. “Atmospheric chemistry: The man who smells forests.” Nature 459: 498-499 (2009). All images used were found on Wikimedia Commons and are Public Domain. Worms and Flies and Fishies (and MORE), Oh My! When we think of scientists, thoughts of lab mice are close behind (à la Pinky and the Brain) but did you know that scientists use many OTHER organisms to study both basic and biomedical sciences? Just imagine: biomedical research using fruit flies could relate directly back to you, who, relative to a fruit fly, are much larger and seemingly more complex! Black sea urchin. Photo courtesy of Lacen/Public Domain. Model organisms are any non-human species that scientists use to understand complex biological processes. Good model organisms are easy to breed, have short life cycles and are often physically small, making them easy to maintain in laboratories and manipulate in experiments. Outside of rodents, common model organisms include, but are not limited to: fruit flies (Drosophila melanogaster), nematode worms (C.elegans), yeast (Saccharomyces cerevisia), zebrafish (Danio rerio), and sea urchins (Arbacia). As expected, model organisms are great at being, well…models. So, it may be hard to imagine how they can be used to understand human health. However, believe it or not, these organisms are great at doing just that! Despite looking dramatically different from humans, many of the key genes in model organisms have gene counterparts (homologs) in humans and other large mammals. This is why fruit flies are useful to scientists study cleft palate and the mechanisms behind diabetes…though more about that later. First, it is important to understand that non-rodent organisms are a hallmark of scientific research and that their influence on scientific progress cannot be overlooked. Some of these species have even earned scientists Nobel Prizes. To grow and develop, organisms need to make new cells from older cells. How does this process work? And how do organisms get rid of these old cells or cells that are “bad”? Using model organisms like yeast and sea urchins, scientists answered these fundamental questions (by discovering the mechanisms behind the cell cycle and apoptosis, respectively) and as a result, expanded our understanding of diseases like cancer at the same time. Yes, sea urchins, like the ones you see at the aquarium, can help us fight cancer! Saccharomyces cerevisiae. Photo courtesy of Masur/Public Domain. In 2001, three scientists won the Nobel Prize for discovering key proteins important in a molecular process called the cell cycle using yeast and sea urchins. The cell cycle is the process by which cells make more cells. They do this through duplication and division of their genetic material and cell growth; it is a highly regulated process. Since cells are the basic building blocks of all living organisms, scientists were lucky to find the ideal model organisms to dissect this mechanism. The first model organism used, yeast, are single-celled, simple eukaryotic organisms whose genome can be easily manipulated, making them popular for genetic studies. They are also inexpensive and easy to grow in lab. Picture Erlenmeyer flasks full of yeast! Sea urchins, the other system used, have eggs that can be harvested and fertilized outside of the animal and, when initiated, divide synchronously, making cell division and development easy to visualize. Using these organisms, the Nobel Prize-winning research discovered several principle cell cycle proteins called cyclins and cyclin dependent kinases (CDKs). Excitingly, these findings about the cell cycle not only developed our basic understanding of cells but set a foundation from which scientists could better understand disease. Cancer is characterized by a lack of cell cycle regulation. Tumors are the result of acquired genetic mutations and uncontrolled cell growth. Yeast and sea urchins, which appear so different from us, enabled scientists to understand fundamental biological processes yet also also provided mechanisms to target in cancer research and treatment. As startling as it may sound, this was not the only time model organisms helped scientists make landmark, prize-winning discoveries. It has occurred countless times throughout science history! C.elegan worms. Photo courtesy of ZEISS Microscopy Germany/Creative Commons. The following year, 2002, three more scientists won the Nobel Prize for their work developing “nematode worms” (C.elegans) as a model organism and using them to study a process scientists call “programmed cell death” or more technically speaking, apoptosis. This is like it sounds. Cells are programmed to self-destruct and this apoptosis is a necessary part of healthy development. Like the cell cycle, understanding apoptosis also improved our understanding of human health. One of the major advantages of C.elegans is that scientists can actually track each individual cell during a worm's development under a microscope. Utilizing the uniqueness of this organisms, scientists observed that the same 131 cells of the total 1090 cells in a developing worm consistently died, indicating that apoptosis was a natural and necessary process and this, in part, led to the identification of apoptosis genes. Apoptosis is evolutionary conserved in other organisms and defects in the process can cause human diseases. It is often triggered when healthy cells detect something wrong. In diseases like cancer, mutations in apoptosis genes allow unhealthy and dysfunctional cells to continue growing. Conversely, an increase in cell death of specific cell types contribute to some neurodegenerative diseases such as Alzheimer’s and Huntington’s Disease. They are more like us (humans) than you would Think! Hopefully it is now clear that non-rodent model organisms are crucial tools used by scientists to dissect basic biological processes, but don’t forget - these organisms can also more directly model human health. Just like with mice, there are a lot of genes in these other organisms that have homologs in humans, making them also great for modeling diseases and drug development. Drosophila melanogaster (fruit fly). Photo courtesy of André Karwath aka AKA/Creative Commons. For instance, in 1980, scientists discovered the hedgehog gene (hh) which is necessary for Drosophila (fruit fly) body patterning. Soon after, scientists found three similar genes in humans. One of these genes, sonic hedgehog (shh) – yes, it is named after the video game – is also important in early human development. Defects in human shh can result in cleft palate birth defects, which occur in 1 of every 1000 newborns. Scientists are therefore using flies to better understand the underlying mechanisms of cleft palate defects and using these studies to guide future research in larger mammals. Now these same flies are also helping scientists understand the mechanisms behind diabetes. Despite being different from humans, insulin affects humans and flies similarly. In humans, insulin regulates the ability of cells to absorb glucose from the blood. In diabetes, this process is blocked. When scientists mutated several insulin-like genes in fruit flies, the insects developed diabetic symptoms and preliminary studies suggested that the cellular reason for their symptoms could be similar to those in humans. The hope is to use these fly models to create drugs and treatments that target these commonalities between flies and humans to ultimately combat diabetes. Of course, as with any model, each system has its limitations, but the importance of using model organisms is clearly not a thing of the past. Studying model organisms and using the information we gain from them serve as the basis of many medical advances. Plus remember: some of the most seminal science discoveries that fill our textbooks were done in these species! Science is an abyss of unknown and model organisms have been, and will continue to be, a vital tool in discovery. Though these studies can stand alone, they also set a foundation for future studies in larger mammals (humans), saving scientists and society time, energy and money. So the next time you see a fruit fly buzzing around your house, as annoying as it may seem, keep in mind that the species helped make countless scientific breakthroughs. “What are model organisms?” Your genome. Public Engagement team and Wellcome Genome Campus, 03 March 2017. http://www.yourgenome.org/facts/what-are-model-organisms. 03 August 2017. "The Nobel Prize in Physiology or Medicine for 2001 - Press Release". Nobelprize.org. Nobel Media AB 2014, 08 October 2001. http://www.nobelprize.org/nobel_prizes/medicine/laureates/2001/press.html. 03 Aug 2017. "The Nobel Prize in Physiology or Medicine for 2002 - Press Release". Nobelprize.org. Nobel Media AB 2014, 07 October 2002. http://www.nobelprize.org/nobel_prizes/medicine/laureates/2002/press.html. 03 Aug 2017. Bedard, James. “Cleft Palate. Defects in Midline Facial Development.” modECODE. Genetics Society of America. http://modencode.sciencemag.org/drosophila/cleftPalate/. 03 August 2017. “ ‘Diabetic flies’ can speed up disease-fighting research”. College of Computer, Mathematical & Natural Sciences. University of Maryland, 06 November 2013. https://cmns.umd.edu/news-events/features/1465. 03 August 2017. It’s that time of year when we can’t walk into a store without seeing displays of chocolate bunnies, marshmallow chicks, and vibrant bouquets of flowers. Along with all these springtime treats, perhaps the most memorable and engaging tradition (and my personal favorite) is the dyeing of Easter eggs. Decorating eggs is a deeply rooted, international tradition. The oldest examples of this activity are the engraved ostrich eggs found in Africa 60,000 years ago. Eggs across many countries and cultures are celebrated, and whether these activities are based on religion or the coming of spring, eggs represent rebirth and life. For those who have participated in egg dyeing, you may have wondered: Why is vinegar added to the dye solution? This can be explained through simple chemistry. You've probably heard of acids and bases - it turns out that all solutions have a degree of acidity or basicity. Acids chemically react with bases to create solutions that are more neutral – that is, closer to pure water. So, back to the initial question – why is vinegar needed to dye an egg? The answer is that most egg dyes need acid to bind the dye to the eggshell. * Vinegar is an acid, and eggshells are bound together by a basic molecule called calcium carbonate. The eggshells base molecules assure that neutral and basic solutions will not change the eggshell. However, vinegar will react with the calcium carbonate shell to dissolve it slightly, allowing the dye molecules to stick to the eggshell, giving you vibrantly colored eggs. * Without adding vinegar to your dye solution, you will likely get very faint coloring. Have you ever tried changing the amount of vinegar added to your dye solution? Because acid is needed for the dye molecule to stick to the egg, you might predict that adding more vinegar to the solution will give you more colorful eggs. This may be true to an extent, but be careful! The acid reacts with calcium carbonate to produce carbon dioxide gas, which will float out of the solution, like carbonation in soda. This gas forming on the surface of the eggshell can leave behind streaks, causing a blotchy dye job. That is why there is an optimal amount of vinegar recommended for the dye solution. Too much vinegar or leaving the egg in the solution too long will eventually dissolve the eggshell. For a neat science experiment exploring this, click here ; you can also find this experiment in Dr. Olivia Mullins' book here! Have you ever seen someone dye eggs with a silk tie? (If not, watch this clip from Martha Stewart!) The patterns on a silk tie can be transferred from the tie onto the egg by wrapping the egg in the tie and submerging it in water with vinegar. Eventually, some of the dye from the tie will be transferred to the eggshell. This is because silk ties are usually dyed using dyes that require an acid to bind – the same reason that dyeing eggs requires vinegar. By adding vinegar to the water, the tie’s dye molecules can be transferred over to the eggshell. Now that you know the chemical principles behind this tradition in addition to some tips and tricks for optimal coloring, there is no reason for not making this Easter your most colorful yet. *Going further: Egg dye molecules are typically sodium salts of a negatively charged molecule called a phenolic acid. In an acidic solution, it gains a H+, allowing it to interact with the surface of the eggshell. In particular, dye molecules interact with slightly negative parts of the eggshell, including the calcium carbonate and some parts of proteins. · “Silky Science: Tie-Dyeing Eggs.” Scientific American. 21 March 2013. https://www.scientificamerican.com/article/bring-science-home-silk-egg-dyeing/. 26 March 2017. · Stewart, Brian. “Egg Cetera #6: Hunting for the world’s oldest decorated eggs.” University of Cambridge. 10 April 2010. http://www.cam.ac.uk/research/news/egg-cetera-6-hunting-for-the-worlds-oldest-decorated-eggs . 26 March 2017.